Pizza Express is under pressure to stop taking a percentage of tips paid to staff on credit cards as what it says is a handling fee. But what happens in other restaurants and where do the tips go, asks Gareth Rubin. When you hand over a tip in a restaurant, who gets it? Most people presume that it goes to the waiter who served your food with a cheery smile. If pressed, you might guess that some goes to the chefs and other workers in the establishment. But you might not realise that a substantial slice of it goes to the company as a fee for "administering" the tip, or even that the restaurant or pub manager will award him or herself a pretty hefty whack of it. In protest at this practice, the trade union Unite is holding a demonstration on Monday outside Pizza Express's flagship Charing Cross branch in London to demand that the company stop deducting 8% from tips paid by credit or debit card. The company says this is a fair cost for processing the money. Unite is not convinced. "The staff feel cheated. Waiting staff are the lowest-paid workers in the UK and are often on the minimum wage," says Dave Turnbull, the union's officer for food and drink. "We had someone from Pizza Express who has been there for 16 years and is still on the minimum wage - so tips are a huge part of their income. In a good night a waiter can make £50 in tips - so if you have 8% taken off you lose £4, and that's a lot of money to someone on the minimum wage. "Customers' tips are subsidising the company's profits - we believe they are pocketing £1m each year this way. Wagamama doesn't charge an admin fee, Pizza Hut doesn't charge, so it's time Pizza Express and the other chains dropped it too." 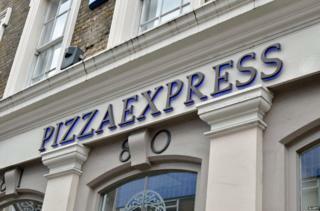 A spokesperson for Pizza Express, which has 430 branches, said: "The allegations made by Unite are incorrect. All tips go to the people that deserve them - our valued restaurant team members. With respect to tips made by electronic cards, we choose to operate a tronc system, which is used by many in the industry. "To cover the administrative costs of ensuring that the tronc system is managed correctly and fairly, a small administrative fee of 8% is levied. Under no circumstances does Pizza Express generate additional profit through the tronc." Many high-street chains deduct fees from tips. These include: Ask (8%), Belgo (10%), Bella Italia (10%), Café Rouge (10%), Giraffe (10%), Prezzo (10%), Strada (10%) and Zizzi (8%). Other chains, such as Carluccio's, Garfunkel's and Jamie Oliver's restaurants do not deduct a fee. "Cash tips stay with the front of house staff and nothing gets deducted for 'admin' or anything like that," says Peter Berry, spokesman for Jamie Oliver's company. "Service charges and credit card tips are shared so that all the kitchen and bar staff also benefit financially. Our staff work hard and deserve to be rewarded." Because there is no law regarding how a tronc is divided, there are reports of managers at independent restaurants abusing the system to pay themselves as much as they want out of the pot, and then handing over whatever is left to the rest of the staff. There are also reports of restaurants adding a service charge to the bill that is simply kept by the owners without a penny being passed on to the staff - which may be morally questionable, but is not illegal. Andrew Percy, the Conservative MP for Brigg and Goole, proposed a law last year to force restaurants to inform customers where their tips were going and to allow staff to decide how the tips were divided, thus preventing managers taking much of the pot. "It's completely ridiculous for these chains to take admin charges - it's all computerised anyway, they don't have to sit down at the end of the night with a ledger and work it out. "And I've had restaurants reported to me where the waiters don't see a penny from the tips, it's all taken by the restaurant. That means the customers are being misled as well as the staff being denied their tips." But banning service charges entirely may not be the best solution to the problem. Fay Maschler, restaurant critic for the London Evening Standard, says: "I feel sorry for waiters. They are mostly on the minimum wage and if you don't put a service charge on, the British are so mean the waiters would only get a miserable amount." So what's you best option if you want your money to go to the waiter or their colleagues? Ask for the service charge to be removed from the bill, hand over a tip in cash, and ask who gets it.